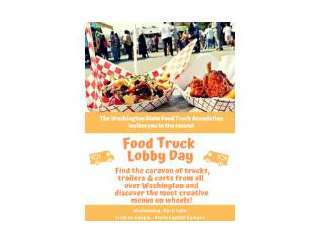 Washington's second "Food Truck Lobby Day" in Olympia will be held on Wednesday, April 24th, 2019 from 11am to 2:30pm. This year, we will incorporate 18-food trucks and trailers from all over the state. As mobile food vending continues to grow as an industry here in Washington, this community has real issues to still be addressed. This is an incredible opportunity for food truck owners to meet their legislative representatives in person and show them we are an important small business industry that is very popular in their communities.